In this invigorating round-up, we kick around the best sports magazine themes for 2019. 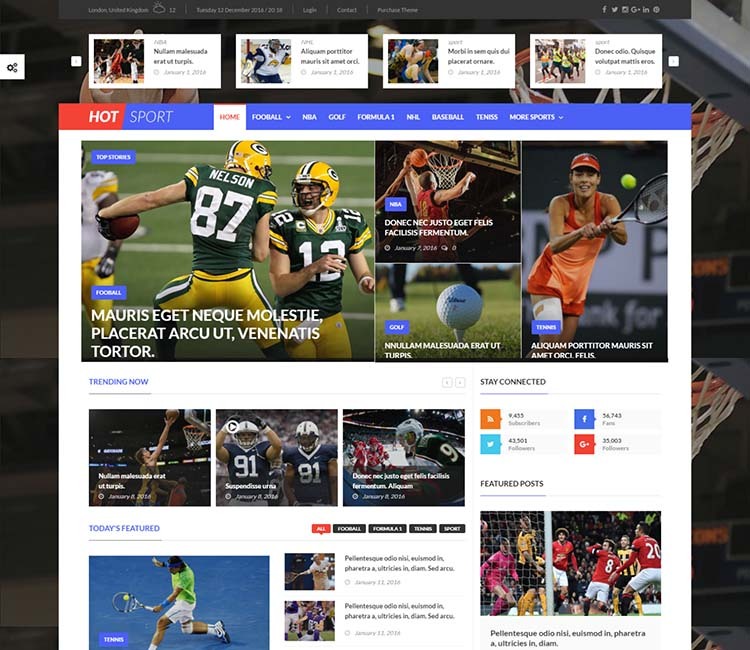 If you’re planning to launch a new ESPN-like or Sports Illustrated style website using the WordPress platform, you’ll save yourself time, money, and even some potential headaches by taking a short cut with one of these excellent, almost turn-key themes. Must-have features, beyond the basics, were SEO friendly coding and top-notch UX. Performance optimization is essential to providing an above average user experience, minimizing bounce rates, and encouraging return visits. We also considered built-in advertising functionality, and WooCommerce support, to aid in monetization efforts a big plus. Although design versatility wasn’t a priority, many of these themes are multi-concept products. They can be heavily customized with presets, admin options, and page builders. Our top spot goes to FlexMag. This is our fave by a wide margin. It’s also directly inspired by ESPN. 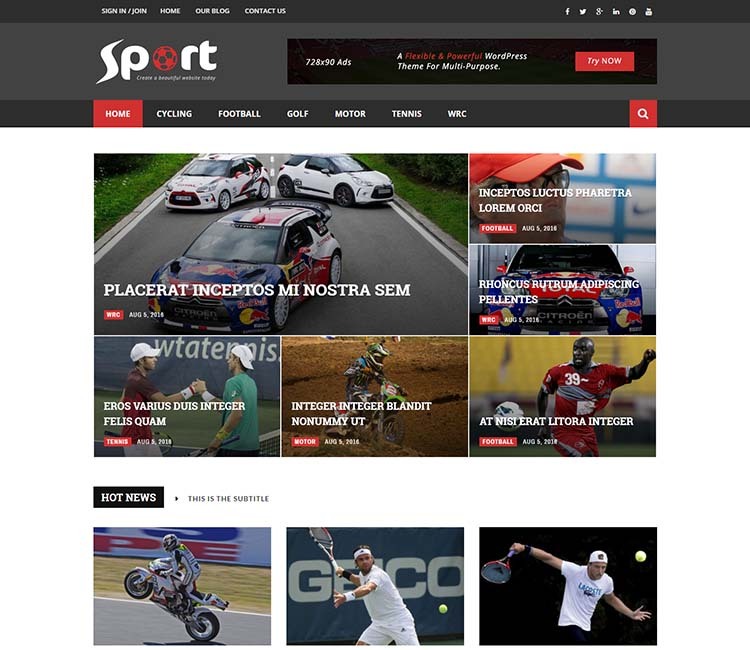 If you haven’t been able to decide on a theme, we assure you that sports magazine themes for WordPress don’t get better than this. 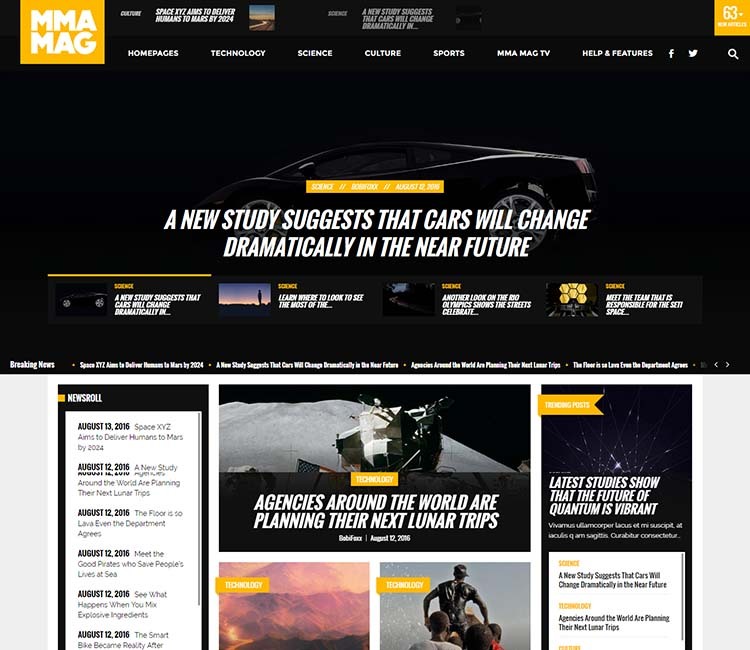 This is a multipurpose magazine theme with several skins. Each is designed for specific niche. Along with the pixel perfect, modern design of the sports preset, you find plenty of excellent usability features. This theme auto loads posts, includes a custom fly out navigation system, provides a custom scoreboard, and offers a variety of layouts. Additionally, homepage layouts are created and edited using drag-and-drop functionality. A mobile first design sensibility guarantees consistency and a top-of-the-line user experience on all devices. Retina capabilities make the theme appear crisp and sharp on the latest high-resolution displays. FlexMag supports WooCommerce and bbPress for building shopping carts and forums. Advertising features help with monetization efforts. The theme is SEO optimized, helping you secure a top spot in the SERPs. Again, if you’ve been on the fence about which sports magazine theme to choose for your site, we don’t think you’ll be disappointed with FlexMag in the least. Highly recommended. 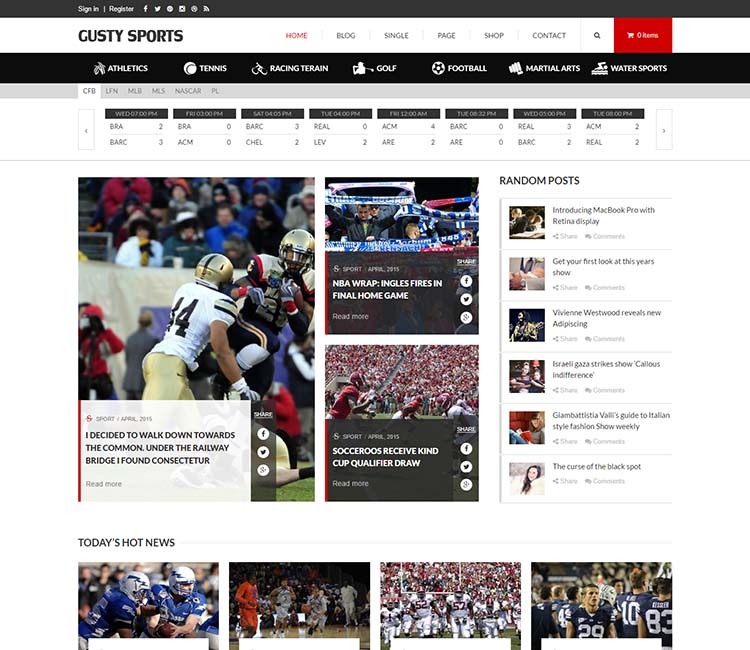 Although our next choice, Gusty, has been largely overlooked since its launch, we can’t help but think it’s one of the strongest options for publishing an online, Sports Illustrated inspired magazine. The design and layout is flexible, with two headers to choose from, three distinct blog pages, and plenty of options on the back-end for adjusting colors and fonts. It integrates WooCommerce for shopping cart functionality, and bundles 29 custom widgets, as well as 15 useful shortcodes. Gusty supports Mega menus, and the theme provides a user-friendly, great-looking gallery slideshow. Translation-ready. 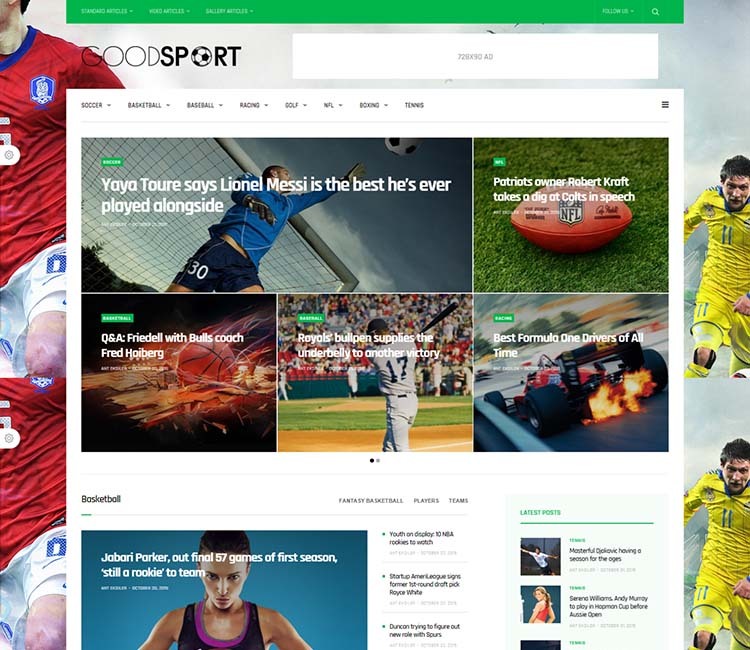 Although developed with mixed martial arts in mind, the developers of the MMA theme have wisely included a preset perfect for other types of online magazines, and an excellent fit for general sports publications. A proprietary plugin that manages fighter information and rankings powers the MMA features. A review system is built-in. MMA includes event management, and the theme supports bbPress for forum and community features. WooCommerce is supported for e-commerce functionality, and MMA is SEO ready and performance optimized. Fast! Hotmagazine is a multipurpose magazine theme that appears on several other of our roundup articles thanks to the awesome presets it has to offer. 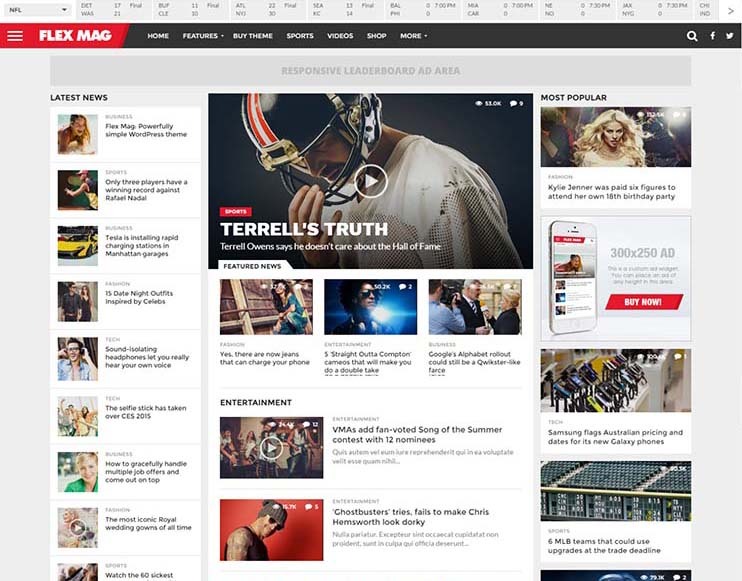 It includes seventeen unique homepages, and nine distinct demos, including a demo tailored toward sports magazines. Hotmagazine packs in a review system, support for responsive banner ads, plug-in compatibility for multilanguage support, as well as lots of options in the admin for quick, code-free customization. It bundles Visual Composer, free, for creating and editing an unlimited variety of complex (or simple…whatever) layouts. The theme is search engine optimized, supporting rich snippet micro data. And it’s all a breeze to set up thanks to the one-click demo installation. I’d be interested to know how long it took developers of Magneto put this theme together. They promote it as the most customizable WordPress theme on the market, and I wouldn’t doubt that’s true. This thing comes with a whopping 120 distinct presets/demos. Of course, much of the variation is thanks to the ease of drag-and-drop page building. Each of the 120 presets is a variation on eight different core themes, and one of those themes was crafted especially for sports magazines. AJAX searching, login/logout, and “load more” features improve usability. The theme integrates social sharing, and provides a review system, and supports bother WooCommerce and bbPress. Plenty of settings are available to tweak on the back-end that help with branding & customization efforts. Goodlife is another huge magazine theme that we’ve written about before. Its sports preset looks awesome (photo backgrounds always deliver), and webmasters can choose between five different article layouts and four different gallery and video pages. The theme additionally provides three different header styles. Bundled free, some cool bonuses: the premium plug-ins Visual Composer, Essential Grid, Rankie, Maintenance Pro, and Viral Quiz Builder. Goodlife is well-integrated with Jetpack and social features. A powerful advertising system will help to monetize your website. The theme is optimized for speed, and coded with SEO in mind. Good stuff. You’ll start to notice a trend here. 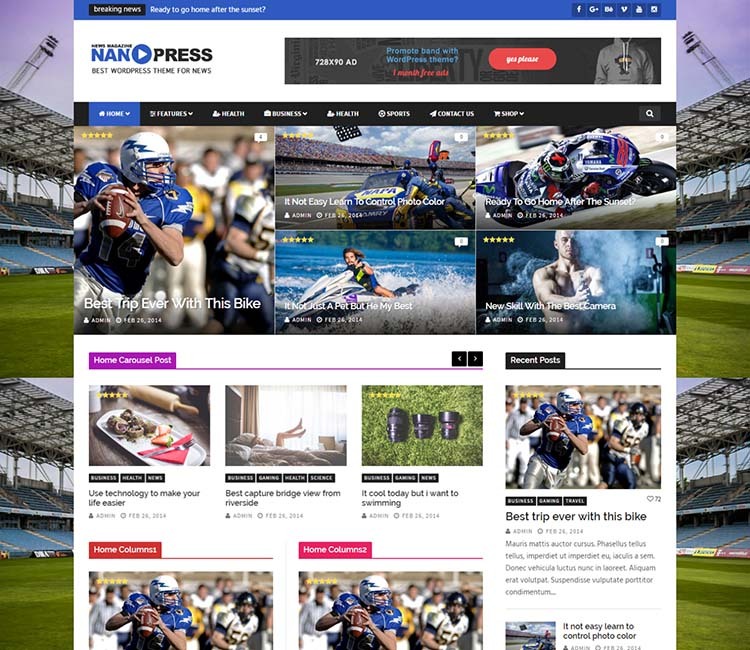 Nanopress is another leveraged magazine theme the features multiple presets and demos, with one created for use as a sports magazine theme. This theme is a bit like Goodlife. It includes three header variations, and seven distinct slideshow variations. The drag-and-drop page builder leaves room open for creating dozens of different layouts. As you’d expect, options on the back-end allow you to customize colors and fonts, and the theme includes custom widgets to add further versatility. Nanopress supports reviews and WooCommerce. 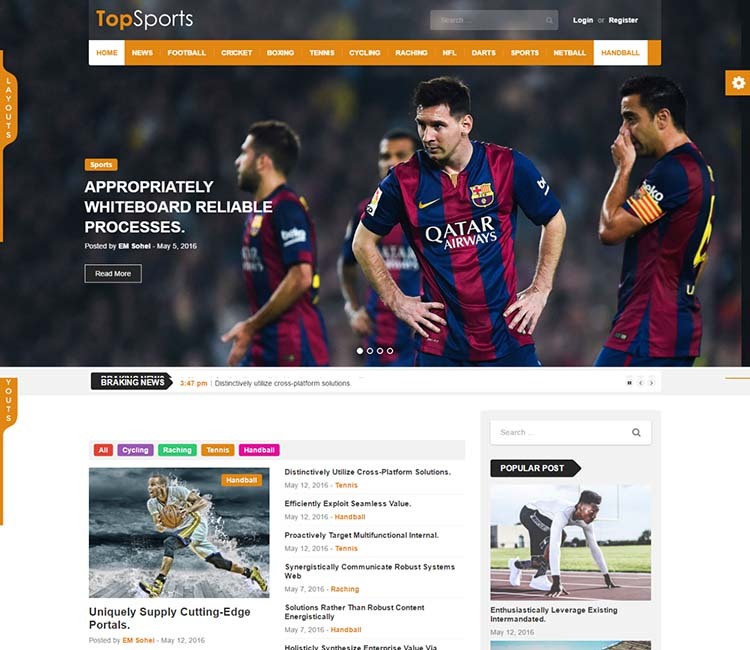 Top news is another solid choice for building your online sports magazine. It includes lots of different header styles, and it supports mega menus. Visual Composer is bundled. The theme is retina ready for high-resolution devices, and 100% responsive. Definitely worth a look. Tired of multiconcept themes yet? Too bad, and here’s one more finish off our list. 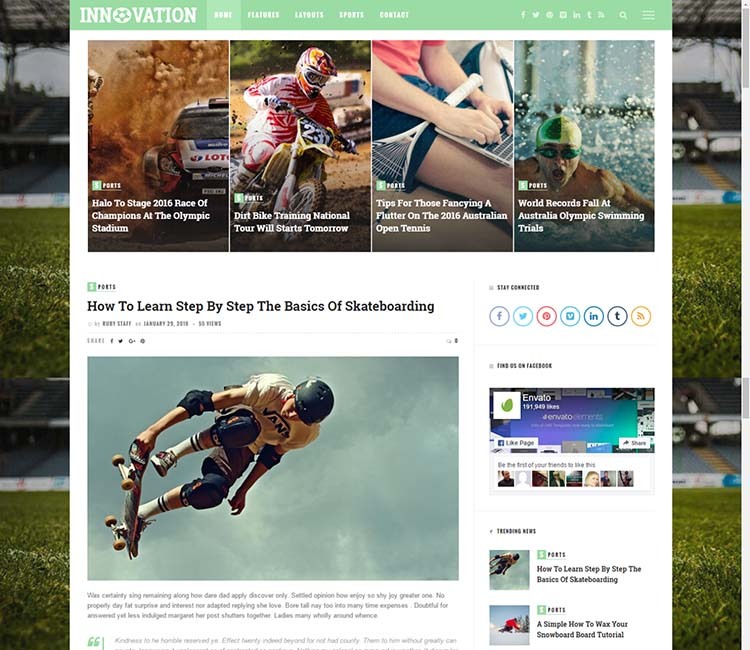 Innovation, now in its second version, includes 11 different niche designs and 250 different homepage layouts. It includes all the features you’d expect from a premium ThemeForest product, including one-click demo installation and a comprehensive options panel. The theme is fully responsive and retina ready. This one offers up a lot more features than we can effectively summarize here, so if you like the look, we recommend clicking through to the product page to get a clearer understanding of what Innovation can do for you.